So I had a plan to create a super helpful guide to the big question I’m asked from time to time. How do I fit three car seats across the back of my car? This isn’t a question I could ever give any advice on myself, because I have two children. Three car seats has simply never been a consideration for me. And honestly I just didn’t put a whole lot of thought into buying my kid’s car seats. Not like I have with prams. And being a pram expert in no way has given me any significant insight into car seats – other than what little I know about car capsule adaptors for travel systems! (Maxi-cosi. It’s almost always Maxi-cosi). But that’s it! I’m really no help at all! Which is why I went to get some expert advice on the topic from the super helpful staff at Baby Train. The plan was I’d go in, I’d learn a bit about car seats, we’d put a whole bunch of different car seats in my car. I had a vision in my head of a video showing installing various configurations of seats, including for newborns, forward facing seats and boosters. It was a good plan! How does the saying go? The best laid plans of mice and men…. Turns out it really wasn’t at all that simple. Apparently my zippy little Kia Rio isn’t really designed for three car seats. It’s POSSIBLE. But it’s not necessarily a great car for showing all the best options because turns out it really is a small back seat. Fine for my two. Not great for three. I’m pretty sure the doors wouldn’t even shut. However! I did learn more about car seats in an hour this morning than I have in nine years of parenting. So I have come back with at least some wisdom to share! 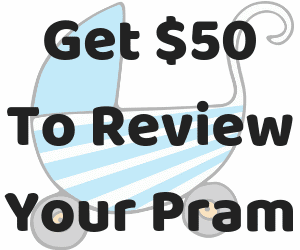 And a plan to revisit the super fun car seat montage video I had imagined at a later date – either with some car seats that are coming out soon OR I may need to borrow a slightly wider car for this review. As I said, I have two kids. Fitting three across the back isn’t something I’ve had to account for previously. AND I will recommend a few narrow car seat options and explain why they are good for fitting three. That said use this as only a very loose guide. The number one piece of advice I’d give after everything I learned today is: Go into a baby store and talk to an expert about YOUR car and YOUR family situation. Because is not a one solution fits all here. I wish I could say “Just get these three seats. Done. Sorted.” But unfortunately it really isn’t that simple! Your car. Obvs. 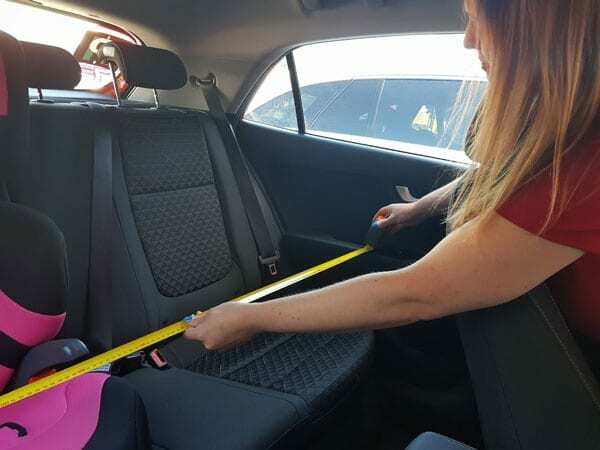 It’s important when you measure your car to take the measurement from the armrest to arm rest, not from the door to door. That few centimeters can make the difference between being able to actually shut your car doors. Your Existing Car Seat(s). Unless you’re having triplets you probably already have at least car seat you’re already using. So it’s ideal to try to fit the additional car seat(s) in with what you already have. However, this won’t always be possible. The ages and stages of your children. What car seat types do you need for your children. And not just for right now, but it’s important to consider how long until they outgrow the type of seats you’re choosing. Otherwise you may need to buy additional seats which is costly. Budget. Depending on the factors above you might not actually have a whole lot of choice when it comes to what works or doesn’t work for your car and your families needs. But just remember – no matter how expensive the right car seats are they’re still cheaper than upgrading to a bigger car! So there’s that. Narrow Seats. Again. Obvs. This doesn’t just mean having a narrow base, or a narrow shoulder – but measure it from the widest point. Keeping in mind though that some seats will actually fit in well together and can be adjusted for a narrower fit. But obviously you are looking for seats that are as narrow as possible. Plenty of space to get to the buckle. Type G Seats. 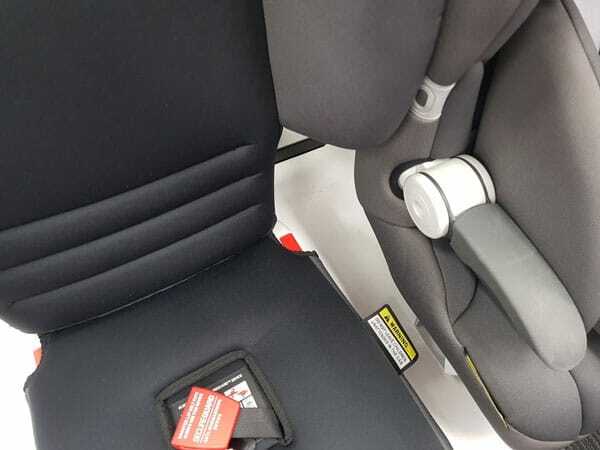 To avoid the issue of having to reach beside the seat to buckle your older child with the lap sash seatbelt there’s the option of Type G car seats. These seats fit up to an 8 year old with an internal 5-point safety harness. So you’ll only ever have to buckle them into the car seat itself. Which is also a safer option. Shoulder Straps That Are Adjustable From The Front. So once you’ve gone through the torture of actually installing your three car seats it’d be great to avoid having to remove the seat and rethread the shoulder straps as your little ones grow. Look for seats that have a lever to adjust the height, rather than having to unhook and thread the straps each time. Get them fitted by a professional. As I said, there is no one size fits all solution here, so getting that professional advice from a store like Baby Train is really worthwhile. And get them installed by a professional as well. They will have tricks up their sleeve for different seats and configurations. For example; putting seats in a semi-reclined position next to an upright seat so they fit better together. Bring your children along. I know bringing children along on a car seat buying expedition would be hard work! However you need to make sure that the car seats fit your child! You don’t want to buy something that your child will outgrow in a short period of time. 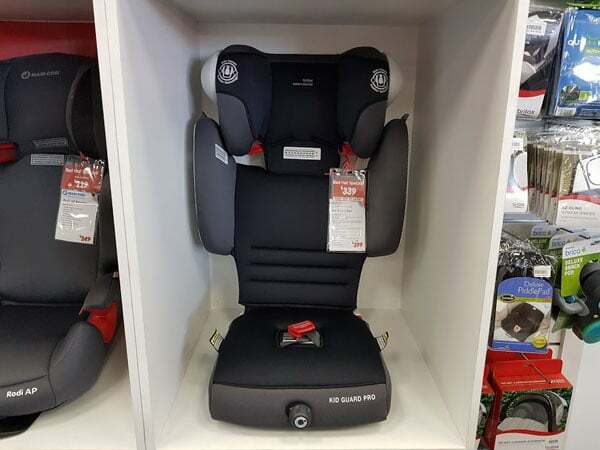 It might be worth doing a reconnaissance mission to find a couple of seats that fit your car, and then before buying just test that they fit your kids. Rear Facing As Long As Possible. Long term rear facing is a good idea anyway for the safety of your child. But it can also make all the difference when fitting in those extra seats. When you have the younger child rear facing in the middle that can offer extra shoulder space for the older two either side. Though this may only be a temporary solution depending on the ages and stages of your children. Don’t Force Them To Fit. Car seats can touch each other and they can touch the door, however you shouldn’t be forcing them in. If you need to force the door shut, or if shutting the door causes all the car seats to shake or move then they’re too big for the space. Try a different configuration. I said I’d get there in the end! Here are some recommendations for what car seats to look for when trying to get to that magic number. Despite looking like a bulky car seat, the Safe and Sound Graphene is surprisingly compact. It’s only 44cm wide, which makes it reasonably narrow. But one of the reasons that this is a great option for fitting in a third child is because it offered the option of longer term rear facing. Which can help with making extra space across the back seat. You can have your child rear facing in the Graphene for approximately 30 months. Around 2 to 3 years. Which is long enough that your older child(ren) may no longer require a booster, thus eliminating the need to fit three children forward facing. Which can be a challenge in some cars. Also the shoulder straps are adjustable from the front using a little lever at the top, which means you won’t have to take the car seat out every time you need to adjust the straps. As the name suggests the Infa Secure Quattro “Treo” was designed with fitting three car seats in mind. 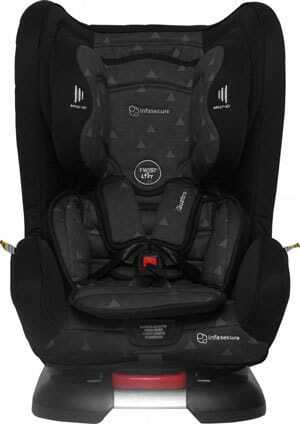 The Quattro is the narrowest car seat with an inbuilt harness, and it is a tiny 42cm at it’s widest point. Like the Graphene it’s also suitable for rear facing up to 30 months. Which can buy you some time at the very least (maybe you’ll be upgrading to the bigger car in the next couple of years?). And it also has shoulder straps that are adjustable from the front. 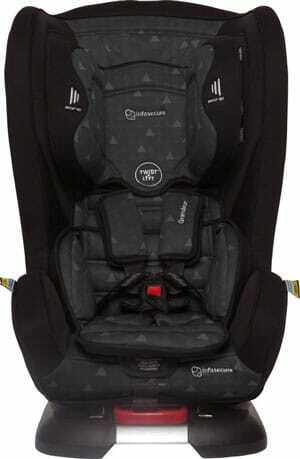 The Safety 1st Prime AP Convertible Booster is usable from 6 months in a forward facing position, up to 8 years. However once your child reaches the height marker for the shoulder straps they will need to use the car’s lap sash belt rather than the inbuilt harness. Which may present a challenge regarding buckling up your older child depending on how much space you have between car seats. That said this quite a narrow, only 45cms wide, and budget-friendly option given you should get many years out of this car seat. 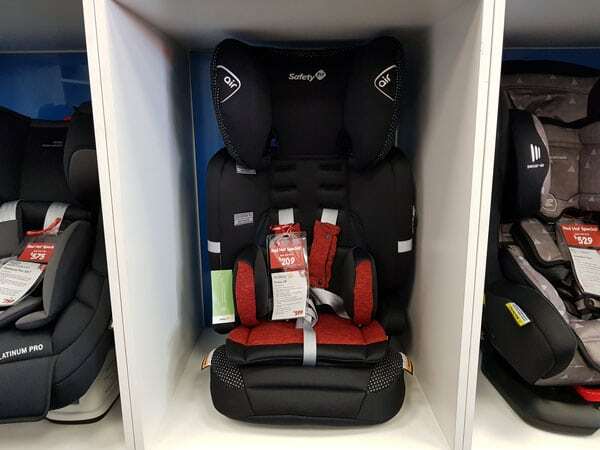 Though also keep in mind it’s apparently a little trickier than normal to remove and install, and you will need to take the seat out to adjust the shoulder straps as your child grows. The Safe N Sound Max Guard Pro is one of the best options for fitting three across – and it’s a car seat I’m familiar with using myself. It ticks all the boxes for forward facing babies all the way up to a “large 8 year old” using the inbuilt hardness. So you don’t have to worry about reaching that buckle with your older child. And like the Safe and Sound Graphene, the shoulder straps are adjustable from the front using a little lever at the top, to avoid having to fuss around taking your car seat in and out every time it needs adjusting. It is 46cms wide, so while it is still a very narrow option, it’s one of the widest on this list. 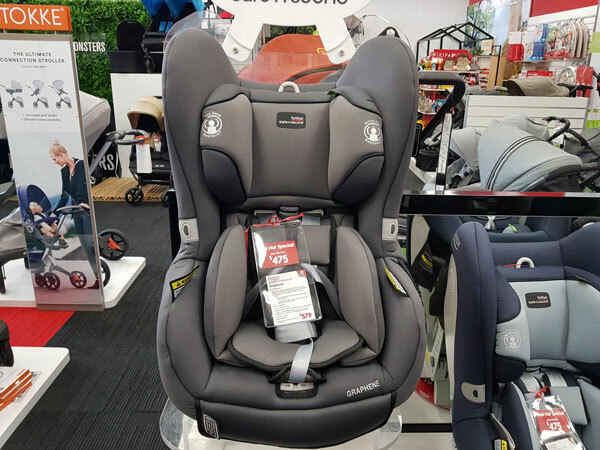 The Infa Secure Grandeur Treo is potentially the only car seat you’ll ever need for each child as it’s suitable from birth all the way up to 8 years, all while using the inbuilt harness. And it also offers extended rear facing. All within it’s maximum width of 44cms. So it’s a great option for potentially all three of your children in matching seats. Though, not surprisingly, this is the most expensive option on this list, so I understand just buying three of them is well out of budget for a lot of people. I’m including the Infa Secure Versatile Booster, even though it’s not an ideal booster seat, it is super slim and was one of the very few options that could fit that third seat into my small car. It is a TINY 40cm wide at it’s widest point. It’s also extremely easy to put in and take out of your car as it does not have an anchor strap, because it weighs less than 2kgs. 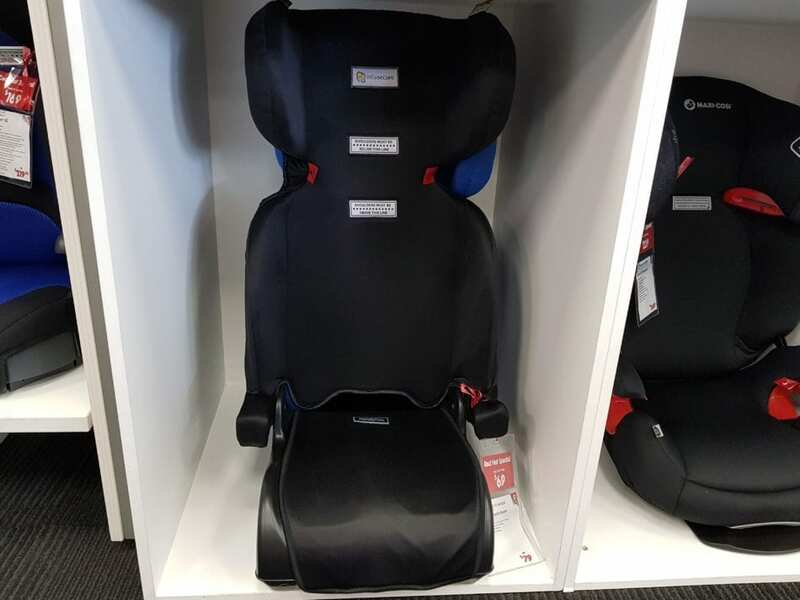 That said it’s not a very big seat, it’s not adjustable, it’s basically just plastic – so it’s not necessarily the safest option (though it does pass Australian Safety Standards). However it would be a good option if you’re not needing to fit three in your car every day, but you just need something light and easy that can fold up and be kept in the boot for the odd occasion where you might be picking up an extra child. It does however have arm rests. So I hope that helps! I am in no way an expert on the topic, and I’m planning to add to this list as I learn more and as new products become available. However this has been a long time coming, I’ve been asked so many times to write about car seats, and I’m still getting my head around them. 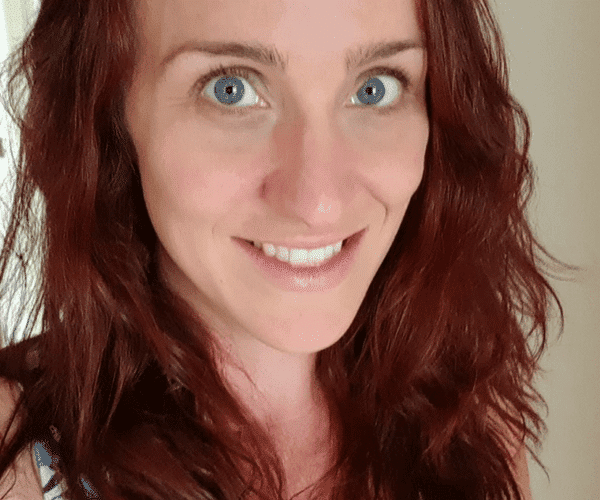 Please let me know if you have any questions – I’ll do my best to answer them! Otherwise if you have any suggestions, tips or recommendations for fitting three car seats don’t hesitate to comment below! From what I heard, small car seats or a bigger car were the best options. It’s tricky. Yep. That’s pretty much the short version. I have a Pajero 7 seater and have 3 across in the middle row. I have 2 SNS maxi guards and a SNS Compaq mkII (RF). Always fit the middle seat first, buy narrower seats! The Safe and Sound Maxi Guards do seem like a great option. One of the reasons we decided against having another kid, lol! It’s something I’ve considered too. Three is a game changer. Parenting Central Yep! We are happy to stick with two, the world seems much friendlier for 2-kid families (plus the thought of having a toddler again makes me feel ill!). It really is. And I think could go another toddler, but I’m a bit done with babies! We got caught out when number 2 turned out to be 2 and 3. We managed to get 3 seats to fit when we had one booster and 2 0-4 seats but 3 boosters would not fit, even with the narrowest ones on the market. So we had to get a new car. Three boosters is hard! At least it worked for a while, so you had time to get a bigger car! Some great tips for parents of three! 5 seater car here and we have three across. 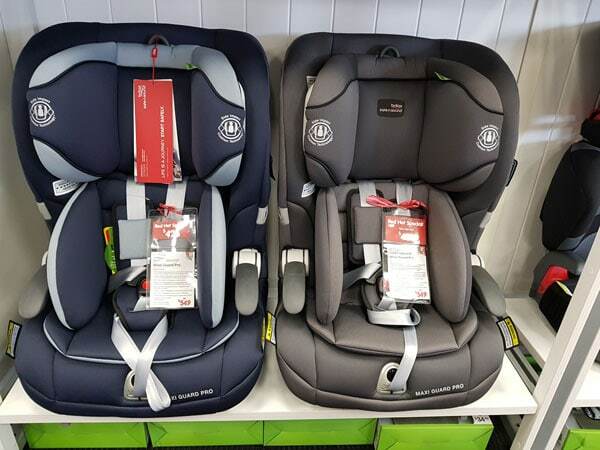 two convertible carseats (one FF one RF) and one convertible booster. all supposed to be slimmer carseats.no tips besides to let someone else install them ?? I think getting someone else to do it is important. It’s so much more complicated than it looked. 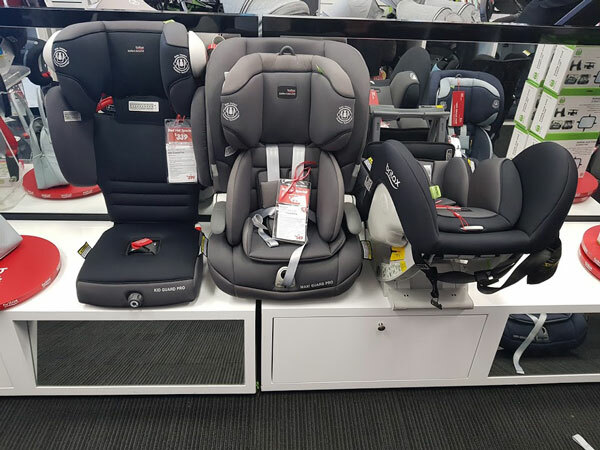 We have managed three seats in both our cars okay… but it definitely helped to take our cars to the baby shops and physically test that the seats fit in the car before buying! I don’t think everyone knows that they will let you do this, its very handy. Yes! That is essential. And car seats can be such a big investment, you need it to be right. Oh that would be hard- I’d pay a professional I think! Fun! Good luck! Also with the capsule they said make sure that the seat next to it doesn’t make it difficult to actually pull the capsule out. I’ve wondered how people managed to fit in three! Lol yep. That’s also one solution. Get a much bigger car. Why not 35k from US and 35k to transfer to Australian standard for the tundra. It’s really hard! I’d be taking it to to a professional! I was just talking about this with someone the other day. Great round up! 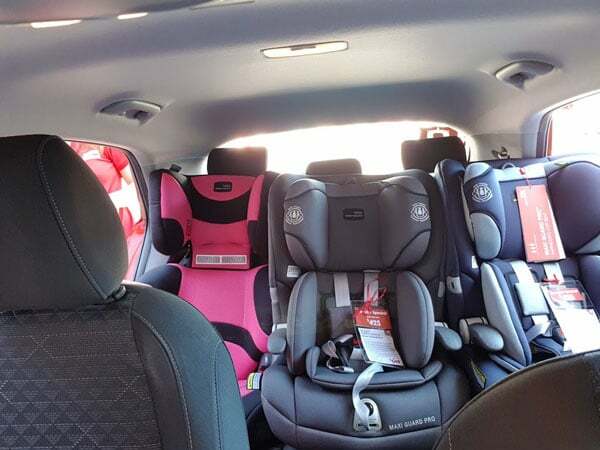 Five kids, all in car seats or boosters. Mini van for the win ? Oh awesome! That’d be a mission buckling everyone up. That’s what we’ve ended up getting as well for the occasions where we have an extra. Nothing else would fit! I wouldn’t want a child in it full time. Even though they do meet safety standards, I also think they’re just not going to be very comfortable! They are such a good option!